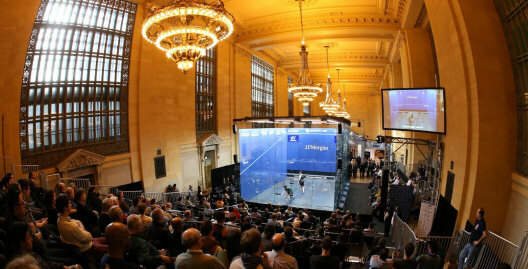 The 2017 World Series calendar begins in New York with the 20th staging of the Tournament of Champions in Grand Central. 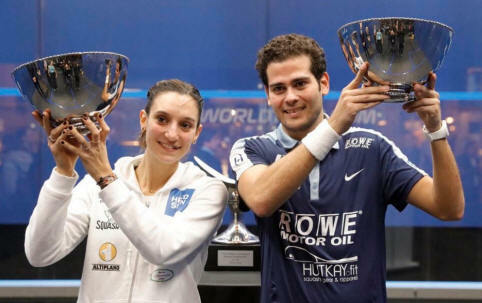 Two new ToC champions were crowned in New York as first-time finalists Camille Serme and Karim Abdel Gawad triumphed on finals night. Serme took on England's Laura Massaro, who led most of the first game only to see the Frenchwoman take the lead in extra points. Massaro recovered to take the next two games, but Serme regained the initiative to capture her second Worlod Series title in a row in America. Gawad, the only Egyptian to make it through to the finals, went a game down to Gregory Gaultier, but denied a French double as he took the next three games, also winning his second World Series title in a row. Semi-finals in Grand Central saw the top-seeded defending champions defeated in both draws. Camille Serme was in impressive form as she beat Nour El Sherbini in four games while Gregory Gaultier made it a French double as he ousted Mohamed Elahorbagy in five games, seeing a two-game lead disappear before reasserting in the decider. 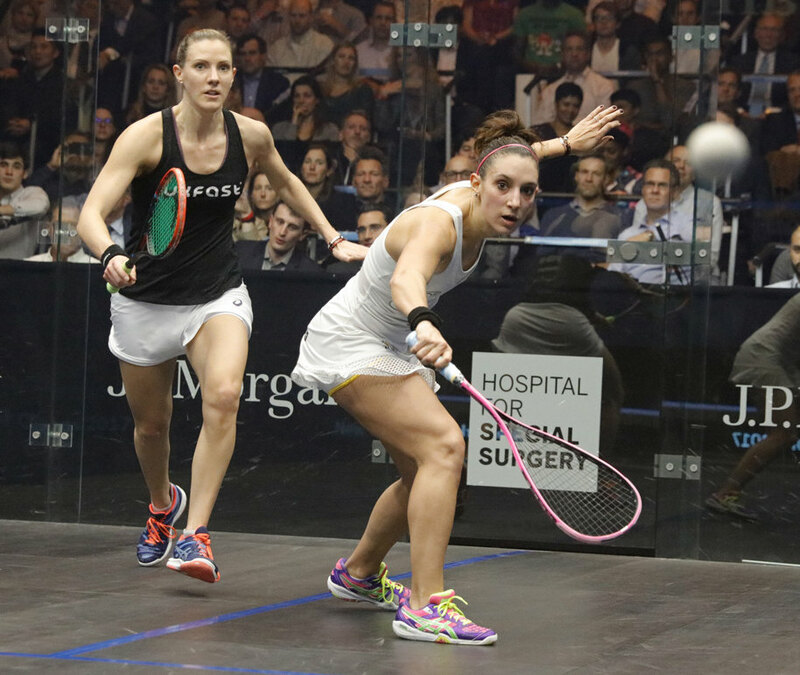 In the finals Serme meets England's Laura Massaro, who prevailed over compatriot Sarah-Jane Perry in straight games while Gaultier faces Karim Abdel Gawad, who was similarly clinical as he despatched James Willstrop. 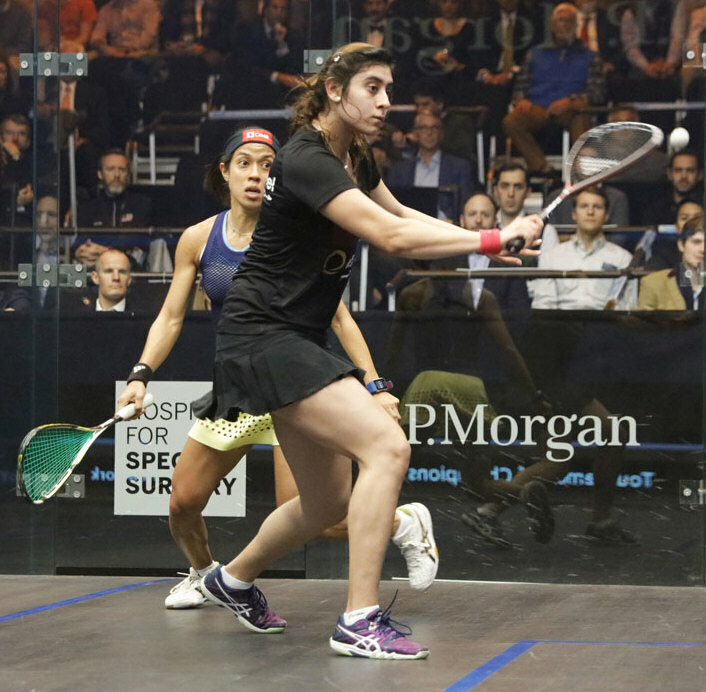 England's Sarah-Jane Perry recorded a second successive seeding upset as she beat Raneem El Welily in a five-gane quarter-final, joining compatriots Laura Massaro and James Willstrop in the last fours. Perry meets Massaro, who beat Omneya Abdel Kawy in straight games, for a place in the final, while the other women's semi will see top seed and defending champion Nour El Sherbini, who beat Nicol David in a thrilling five-setter, take on France's Camille Serme, a four-game victor over Nouran Gohar, in a repeat of their U.S. Open final last October. Unseeded Willstrop came from a game down to beat qualifier Paul Coll, and he now faces World Champion Karim Abdel Gawad, who did the same as he beat Simon Rosner. The two draws have now caught up, with men's and women's semi-finals tonight in Grand Central. The crowd at Grand Central were treated to ten matches today as women's round two was played in its entirety, with just one seeding upset - although world #1 and #2 Nour el Sherbini and Nouran Gohar both needed all their skills to get past compatriots - as Sarah-Jane Perry beat home favourite and last year's runner-up Amanda Sobhy in five games. 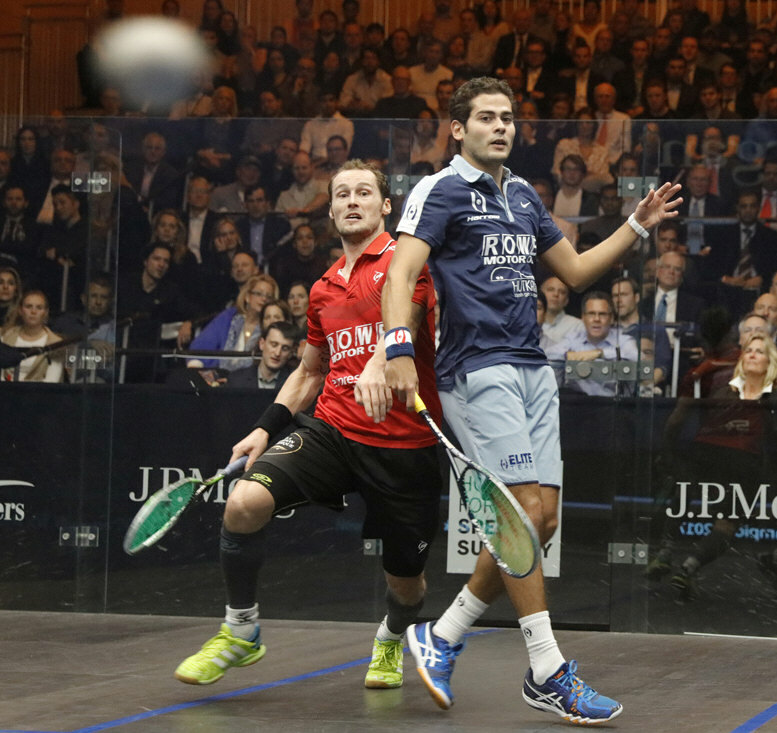 There were two men's quarter-finals too, in which Gregory Gaultier beat Tarek Momen in four games and defending champion Mohamed Elshorbagy beat younger brother Marwan in three. The quarter-finalists in the top half of the men's were decided with just one upset, but only after third seeded former champion Gregory Gaultier mounted a dramatic comeback from two games down against Fares Dessouky. He'll face more Egyptian opposition in Tarek Momem, who beat seventh-seeded compatriot Omar Mosaad in straight games. Whoever wins that will face either Mohamed or Marwan Elshorbagy in the semi-final. There's strong Egyptian presence in the top half of the women's draw too, with wins for Nour El Sherbini, Nouran Gohar, Nour El Tayeb and an upset over Alison Waters for Salma Hany. Those four will meet to guarantee two Egyptian quarter-finalists, while Nicol David faces Annie Au, and Camille Serme meets Joshna Chinappa. Two milestones on Sunday at Grand Central as James Willstrop ends a 10-year wait to record a PSA win over English rival Nick Matthew in a second round clash between two former ToC champions, and Natalie Grinham's 20-year career comes to an end as the wildcard bowed out to Joelle King. Willstrop now meets Paul Coll, the Kiwi qualifier who added yet another scalp to his ever-growing list by beating sixth-seeded Ali Farag in four games. Women's round one concluded with one minor upset as India's Dipika Pallikal beat Emilt Whitlock in four games. 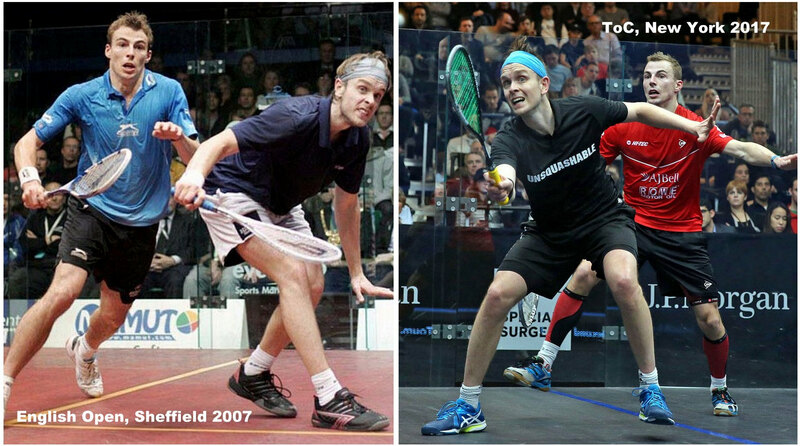 Just a few weeks after their meeting in the BGP final in Manchester, England's Nick Matthew and James Willstrop will meet again after first round wins in New York. As round one concluded at Grand Central two qualifiers - Paul Coll and Nicolas Mueller - progressed to the last sixteen with upset wins over Chris Simpson and Saurav Ghosal, while women's qualifying concluded with Nele Gilis and Hania El Hammamy beating the top two seeds. 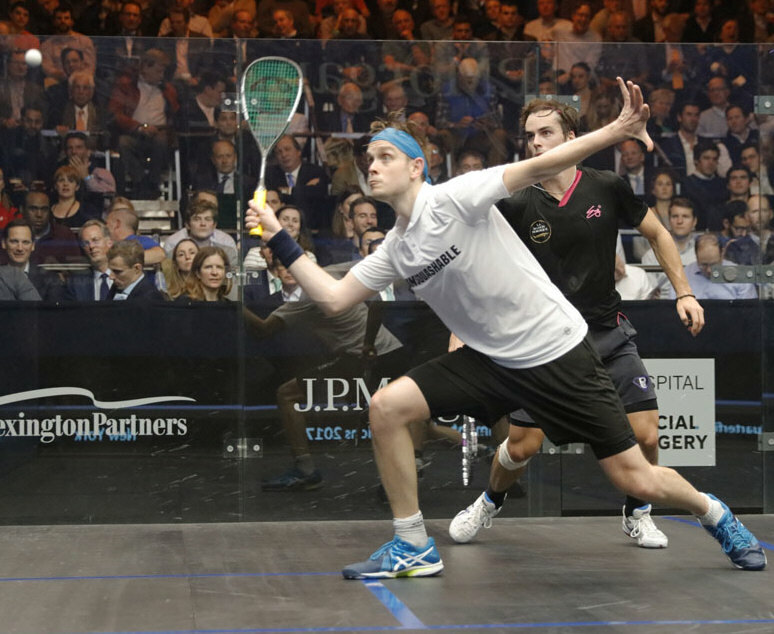 Spearheaded by top seed Mohamed Elshorbagy - on his 26th birthday - five Egyptians won through to the second round on the opening day of action on the glass court at Grand Central. Meanwhile women's qualifying got under way at various New York clubs. Plenty of upsets in the qualifying finals in New York as four of the five seeded players - including the top three of Cesar Salazar, Greg Marche and Omar Abdel Meguid - failed to make the main draw as they lost out to Raphael Kandra, Tsz Fung Yip and Alan Clyne. Declan James took out fifth seed Leo Au in a marathon five-setter - earning a shot at the defending champion and world #1 - while seventh seed Nicolas Mueller had to come fropm two games down before beating Alister Walker 13-11 in the fifth. Men's qualifying began at four New York clubs, and while the top eight seeds all progressed, second seed Greg Marche needed all five games to see off Ramit Tandon, as did his next opponent Tsz Fung Yip, who came from two games down to deny Joel Makin. There was no joy for the hosts as all five US players fell at the first hurdle.